This Bighorn fifth wheel by Heartland RV features a private front bedroom with king size bed, a rear living entertainment layout, and FIVE slides for added interior space! Enter and find yourself in a very functional Bighorn kitchen featuring dual slides for loads of space. There is a slide out dinette with two chairs along the curb side wall. Along the opposite side of the fifth wheel, a second slide featuring a double door refrigerator, a three burner range, plus large pantry for your dry and canned goods. An island counter in the center makes food prep and serving easy, plus it is the location of the double sink. There are counter-tops on both sides of the kitchen, plus ample storage with upper cabinets and lower cupboards and drawer space too. To the rear of this unit you will find a separate living room space featuring a rear wall entertainment center and storage. There is also space along the side of the TV area for a desk that is perfect for laptop use. Dual slide outs feature sofas, and there is also a theater seat for two including cup holders along the interior of this room. A great space for gather with family and friends, plus the sofas can accommodate a few overnight guests easily as well. Back through to the front head up the steps to the right of the main entry door. Here you will find a complete bath including a shower with seat, a toilet, a vanity including sink and overhead medicine cabinet, plus linen storage. The front private master bedroom is quiet and comfortable with a slide out king size bed so you can get a great night's rest. Opposite the king bed you will find a dresser, plus there is a full front wall wardrobe for your hanging clothes. A corner closet has also been prepped for a washer and dryer so you can easily add the appliances if you like. This makes longer travels convenient, and you don't have to come home from your vacation with a pile of dirty laundry. You will also love the exterior storage, and Mega tall slide that is over 7 feet! As your Rochester, New York RV dealer we are here to answer any questions you have. 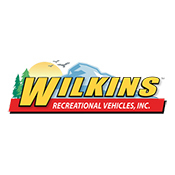 Whether you're a new or seasoned RVer we are sure to have an RV that meets your needs. From class A motorhomes to practical travel trailers, we've got it all. Check out our new and used inventory online and get in touch with us to learn more about available floorplans.